How good a thing it is to be alone, is manifested and shewn both in the Old Testament and also in the New. For in both we find that God revealed his secret counsels and his heavenly mysteries to his dear friends, not in the presence of a multitude, but when they were by themselves alone. 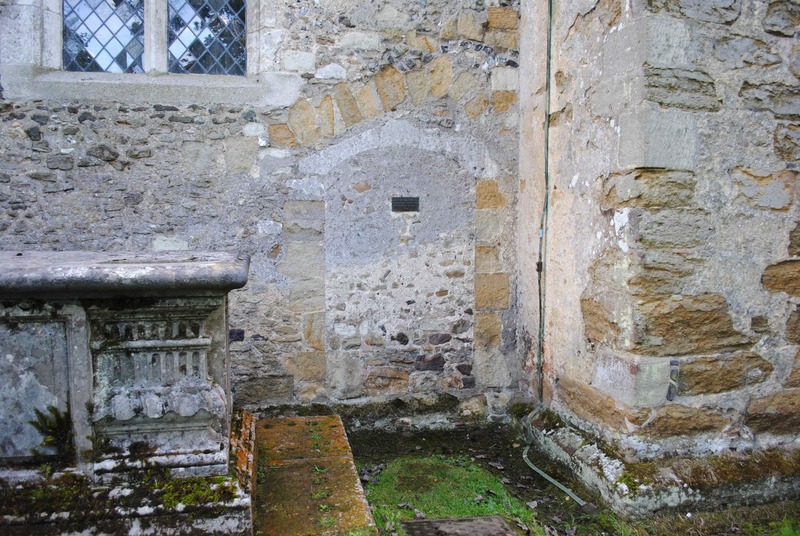 Early in the summer of 1329, Christine Carpenter, a young woman living in the village of Shere in Surrey, petitioned the Bishop of Winchester, seeking permission to become an anchoress. Several men of the village, including Christine’s father, William (a carpenter by trade), were asked to vouch for her devoutness and virginity. 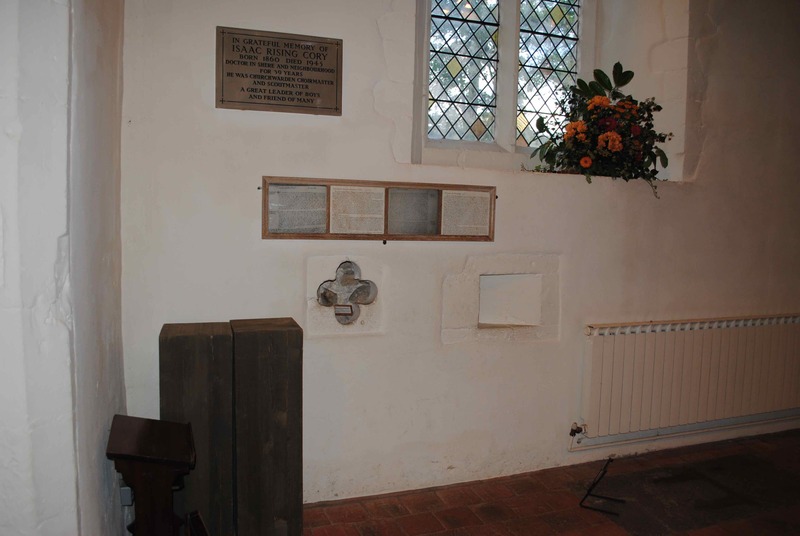 The answers must have been satisfactory because in July of that year Christine was, with due ceremony, locked in her cell in the north wall of St James’ Church, also in Shere, and so began her new life of solitude and contemplation. The remains of the cell are still visible. The photograph above shows the exterior (centre of frame). There would have been some kind of opening through which Christine could communicate, receive food and have her bodily waste removed. My guess is that the cell would have been no more than five feet high, three feet wide, and a foot and a half deep. At some point in the next three years Christine decided that the life of an anchoress was not for her. She left the cell, though by what means and with whose help is unknown. In her article for the Oxford Dictionary of National Biography, Liz Herbert McAvoy writes that after her release, Christine ‘was seen to be “gadding about” the countryside, engaging with the dangers of sinful temptation, and in her wanderings presenting a ready prey for the devil’. Then Christine had a change of heart, perhaps because she was facing excommunication for having reneged on her sacred vows, perhaps because she wished to recommence the holy life, perhaps a bit of both. In the autumn of 1332 she asked the Bishop to allow her to return to her cell. Permission was granted but this time her enclosure was to be permanent. The Episcopal Register of the time contains a communication to the Dean of Guildford, in which the Bishop orders that ‘the said Christine shall be thrust back into the said re-enclosure, and that with suitable solicitude and competent vigilance you shall take care to guard her, thus enclosed, in due form, that she may learn at your discretion how nefarious was her committed sin, and that thereafter dedicating herself worthily to God, having first offered to God that which is inflicted on her by us, she may be enabled to achieve her salvation’ (quotation from the St James’ Church pamphlet, ‘Christine Carpenter, The Anchoress of Shere’). Professor McAvoy says it is likely that the wooden door of the cell was removed and Christine was then walled in. The photograph above shows, on the left, the quatrefoil opening (squint) through which Christine would have received communion. On the right is the squint through which she could see the altar. When and how Christine Carpenter died is not known, but it’s unlikely that she ever left the cell again.